There are no easy conclusions in The Fact of a Body, but there are many moments of profound revelation. Marzano-Lesnevich’s memoir is a braided narrative, weaving together Langley’s story and her own. She plays with the concept of proximate cause, untangling the long string of events that led her to Ricky Langley, and the long string of events that led Ricky Langley to Jeremy Guillory. But the book is actually something of a tribrid, with a third strand that’s about the act of braiding itself: how a story evolves in the telling; how each storyteller decides which facts are important, projects her experience onto the events and the characters (here, quite literally, the author allows herself to imagine details of Langley’s narrative that aren’t captured in the record). Most provocatively, Marzano-Lesnevich forces us to question how all of those factors work when applied to the legal system. What are cases but stories? What are trials but showdowns between competing versions of the truth? What are lawyers, and judges and juries, but people who do what people always do: superimpose their own perspectives onto the matter at hand? What part can empathy play in a criminal justice system predicated on the delusion that there’s one version of the truth, one set of facts, one story? Alexandria Marzano-Lesnevich’s first book, THE FACT OF A BODY: A Murder and a Memoir, has been released by Flatiron Books (Macmillan) in May 2017, as well as from publishers internationally. The book layers a memoir with an investigation into, and recreation of, a 1992 Louisiana murder and death penalty case. For her work on the book, Marzano-Lesnevich received a National Endowment for the Arts fellowship and a Rona Jaffe Award, and has twice been a fellow at both MacDowell and Yaddo. Other scholarships and fellowships received include those from the Bread Loaf Writers’ Conference, the Millay Colony for the Arts, Blue Mountain Center, Kimmel Harding Nelson Center, Djerassi Resident Artists Program, the Studios at Key West, Vermont Studio Center, and the Alice Hayes Fellowship for Social Justice Writing from the Ragdale Foundation. Her essays appear in The New York Times, Oxford American, Iowa Review, Hotel Amerika, The Rumpus, and the anthologies True Crime and Waveform: Twenty-First Century Essays by Women, among many other publications, and were recognized “notable” in Best American Essays 2013, 2015, and 2016. She was educated at Harvard (JD), Emerson College (MFA), and Columbia University (BA) and now teaches at Grub Street, a nonprofit writing center in Boston, and in the graduate public policy program at Harvard’s Kennedy School of Government. She is a nonfiction faculty member at the Cambridge Writers’ Workshop Summer in Granada, Spain Writing Retreat (August 2-6, 2017). 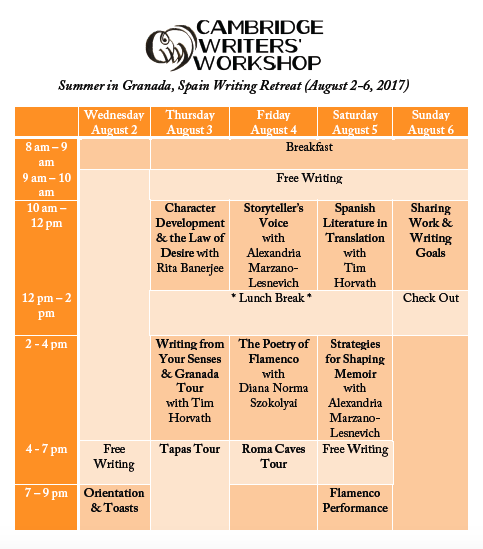 Summer in Granada, Spain Writing Retreat Class Schedule and June 1, 2017 Deadline! 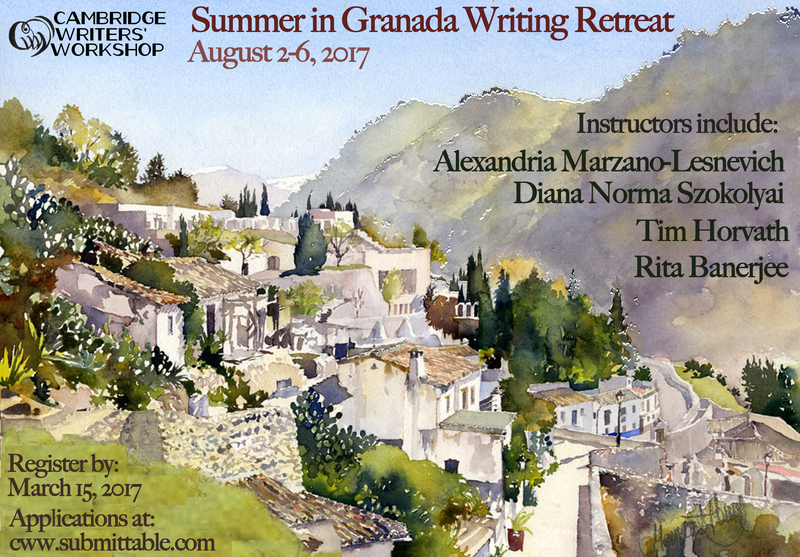 The Cambridge Writers’ Workshop’s Summer in Granada Writing Retreat will take place from August 2-6, 2017. Located at the foot of the Sierra Nevada mountains in Andalucía, Granada is one of the gems of Spain and has inspired writers from Washington Irving to Salman Rushdie to Ali Smith. Let the old city stimulate your writing with its winding streets, Moorish history, and evocative landscapes. Located at the foot of the Sierra Nevada mountains in Andalucía, Granada is one of the gems of Spain and has inspired writers from Washington Irving to Salman Rushdie to Ali Smith. Let the old city stimulate your writing with its winding streets, Moorish history, and evocative landscapes. The retreat offers multi-genre workshops, as well as craft seminars and time to write. The faculty includes award-winning writers Tim Horvath, Alexandria Marzano-Lesnevich, Rita Banerjee, and Diana Norma Szokolyai. Genres include fiction, nonfiction, and poetry. To apply, please submit an application at http://cww.submittable.com by June 1, 2017. Of all types of prose, personal narrative is perhaps the most inherently voice-driven. After all, the reader is essentially choosing to spend a lot of time with you, the author. Too often, the writer’s desire to be relatable on the page results in a watered-down, bland voice, when a distinctive voice is what’s needed to keep the reader engaged. (As V.S.Pritchett put it, in memoir, you get no credit for the living—it’s all in how the living’s told.) So how can you find—and sharpen—your narrative voice? Will it be crisp like Didion’s? Humorously exaggerated like Sedaris’s? Lyrically gritty like Ballantine’s? We’ll look at exceptional examples of voice in memoir and personal essays, and diagnose what makes them so successful. We’ll discuss ways to identify and amplify whatever yours is, working to make it even more distinctive. Come prepared with an essay or chapter draft to work on. It is a given that writers must learn to read closely, with attention to nuance and craft, to unravel the methods by which other writers have managed to tell stories effectively and adapt them for their own purposes. In this class, we’ll focus on writers in Spanish and Portuguese, from canonical authors like Borges, Marquez, Valenzuela, Cortázar, and Lispector to contemporary luminaries and up-and-comers such as Eduardo Halfon, Valeria Luiselli, Javier Marías, and Laia Jufresa. We’ll swerve through techniques of developing metafiction and surrealism, magical realism, and philosophical fiction, and blending these with realism where suitable. 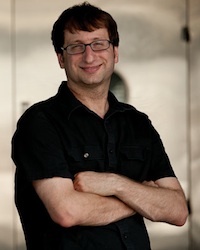 We’ll also explore the fraught, infinitely rich topic of translation, discussing its complexities really and the ways that understanding the innumerable decisions involved in bringing a work into another language can shed light on the act of “translating” any experience or concept from mind or world onto the page, i.e. writing itself. Even the wildest life, recounted straightforwardly from memory, will suffer from what Sven Birkerts calls “the coma-inducing effect of ‘and then.’” Good memoirists know this. So they reach into literature’s bag of tricks and find other ways to keep the pages turning: they speed time up in some places and slow it down in others; they layer two or more threads; or perhaps they find a structure that helps evoke the book’s meaning. All these considerations are part of shifting from thinking about your life as a life to thinking about the book as a book. But how can aspiring memoirists ready themselves to make that leap? In this session we’ll discuss strategies and approaches, as well as break down the choices made by a few published memoirists as they turned memory into literature. Then we’ll do a few exercises to help free you to do the same with your own material, turning life into art. Diana Norma Szokolyai is a writer and Executive Artistic Director of Cambridge Writers’ Workshop. Her edited volume, CREDO: An Anthology of Manifestos and Sourcebook for Creative Writing, will be released by C&R Press on March 7, 2018. She is author of the poetry collections Parallel Sparrows (honorable mention for Best Poetry Book in the 2014 Paris Book Festival) and Roses in the Snow. She also records her poetry with musicians and has collaborated with several composers including David Krebs (US), Robert Lemay (Canada), Claudio Gabriele (Italy), Peter James (UK), Jason Haye (UK), and Sebastian Wesman (Estonia). Her poetry-music collaboration with Flux Without Pause, “Space Mothlight,” hit #16 on the Creative Commons Hot 100 list in 2015. Her work has been recently reviewed by The London Grip and published in VIDA: Reports from the Field, The Fiction Project, Quail Bell Magazine, Lyre Lyre, The Boston Globe, and elsewhere, as well as anthologized in Other Countries: Contemporary Poets Rewiring History, Always Wondering, and the International Who’s Who in Poetry 2012. She is currently at work on her next book and an album of poetry & music. On our final day, participants enjoyed a session of energizing yoga with Elissa. After yoga, some people went for a stroll by the ocean and the faculty made brunch for the participants. Jade and Elissa made delicious, fluffy, flax-seed vegan pancakes. Norma made a scrumptious onion, cheese and seasalt omelette. Orange juice, coffee and fresh fruit made the farewell brunch refreshing. During the meal, the faculty and writers sat around the table and discussed writing goals for the future. We even vowed to stay in touch and will keep sharing our work and workshopping on the Cambridge Writer’s Workshop NING member network (learn more about that here). It was amazing how we created such a supportive community in the space of just three days. We were sad to see everyone leave, but can’t wait to see some of our writers returning at our upcoming retreats in Barcelona & Narbonne as well as Granada!